Khrunichev's initial design called for the use of a modified RD-170 for first stage propulsion and a liquid hydrogen powered second stage. By 1997, the hydrogen-powered second stage had been abandoned in favor of kerosene, and the RD-170 was replaced with a modular design which would be powered by the new RD-191, a one-chamber engine derived from the four-chamber RD-170. In late 1997 Khrunichev was given approval from the Russian government to proceed with their new design, which would both be able to replace the ICBM-based Dnepr, Tsyklon, and Rokot with its smaller variants, as well as be able to launch satellites into geostationary orbit from Plesetsk with the Proton-class Angara A5. This new modular rocket would require construction of a new launch pad. 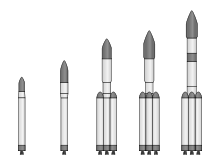 The Angara rocket family, from the 1.1 to the A7. Maiden flight and first commercial flight of Angara A1.2. The South Korean launch vehicle Naro-1 used a first stage derived from Angara's URM-1 (fitted with a lower-thrust version of the RD-191 engine called RD-151). The vehicle made its first flight on August 25, 2009. The flight was not successful, but the first stage operated as expected. A second launch on June 10, 2010 ended in failure, when contact with the rocket was lost 136 seconds after launch. The Joint Failure Review Board failed to come to a consensus on the cause of the failure. The third flight on January 30, 2013 successfully reached orbit. ^ "Angara Launch Vehicle Family". Spaceflight101. Retrieved September 11, 2017. ^ "Kazakhstan Finally Ratifies Baikonur Rental Deal With Russia". SpaceDaily. April 12, 2010. Retrieved July 11, 2014. ^ Zak, Anatoly (July 3, 2016). "Origin of the Angara project". RussianSpaceWeb. Retrieved September 11, 2017. ^ a b c d Vorontsov, Dmitri; Igor Afanasyev (November 10, 2009). "Angara getting ready for launch". Russia CIS Observer. 3 (26). Archived from the original on January 1, 2010. Retrieved January 3, 2010. ^ Zak, Anatoly (August 2, 2017). "Building Angara". RussianSpaceWeb. Retrieved September 11, 2017. ^ "A new engine is ready for Angara" (in Russian). RU. September 5, 2008. ^ "URM-1 is being prepared for the burn tests" (in Russian). January 29, 2009. ^ "Interview with Vladimir Nesterov, Director-General, Khrunichev Space Center". Khrunichev. RU: Marker. January 13, 2011. ^ "Preparations for the first Angara launch". RussianSpaceWeb.com. August 15, 2014. Retrieved September 11, 2017. ^ Stephen Clark (July 9, 2014). "First Angara rocket launched on suborbital test flight". Spaceflight Now. Retrieved July 10, 2014. ^ Sample, Ian (July 9, 2014). "Russia test launches first new space rocket since Soviet era". The Guardian. Retrieved July 10, 2014. ^ a b c "Russia made its first test launch "Angara-A5"". RIA Novosti. December 23, 2014. Retrieved December 23, 2014. 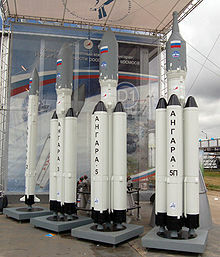 ^ a b c d "Angara Launch Vehicles Family". Khrunichev. Retrieved July 25, 2009. ^ a b "Angara A5". Spaceflight 101. Retrieved May 4, 2018. ^ Zak, Anatoly (January 12, 2016). "URM-1 rocket module". RussianSpaceWeb. Retrieved September 11, 2017. ^ a b c "Angara 1.2". Spaceflight 101. Retrieved May 4, 2018. ^ Zak, Anatoly (October 9, 2016). "URM-2 rocket module". RussianSpaceWeb. Retrieved September 11, 2017. ^ Zak, Anatoly (July 22, 2017). "Angara to replace Proton". RussianSpaceWeb.com. Retrieved September 11, 2017. ^ a b c d "Angara Launch Vehicles Family". khrunichev.ru. Khrunichev State Research and Production Space Center. Retrieved May 4, 2018. ^ a b "Angara, Russia's brand-new launch vehicle, is successfully launched from Plesetsk". Khrunichev. Retrieved July 11, 2014. ^ "Angara A2". Spaceflight 101. Retrieved May 4, 2018. ^ Zak, Anatoly (July 21, 2017). "Angara-5P launch vehicle". RussianSpaceWeb. Retrieved September 11, 2017. ^ Zak, Anatoly (July 23, 2017). "Angara-A5V (Angara 5V) launch vehicle". RussianSpaceWeb. Retrieved September 11, 2017. ^ "Angara A7". Spaceflight 101. Retrieved May 4, 2018. ^ Zak, Anatoly (November 12, 2011). "The Angara-7 rocket". RussianSpaceWeb. Retrieved September 11, 2017. ^ Zak, Anatoly (January 8, 2013). "Angara-100". RussianSpaceWeb. Retrieved 11 September 2017. ^ "Baikal Reusable Launch Vehicle". Khrunichev. Retrieved January 3, 2010. ^ a b c "KVTK" (in Russian). Khrunichev State Research and Production Space Center. ^ "Angara A7". Spaceflight 101. Retrieved July 11, 2014. ^ Zak, Anatoly (November 14, 2014). "Angara to move to Vostochny". RussianSpaceWeb.com. Retrieved November 14, 2014. ^ "Russia Reviews Proton Breeze M Reliability". Aviation Week. March 19, 2013. Retrieved May 4, 2018. ^ "Разгонный блок "Бриз-М" вывел на целевую орбиту условный спутник, запущенный на "Ангаре"" [Briz-M upper stage brought satellite to orbit, launched by Angara]. ITAR-TASS (in Russian). December 23, 2014. Retrieved December 23, 2014. ^ a b c d Pietrobon, Steven (December 23, 2017). "Russian Launch Manifest". Retrieved December 23, 2017.